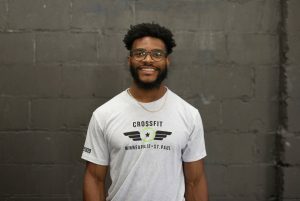 My intro to CrossFit: During a conversation with one of my former college track teammates, he told me that he starting doing this crazy thing called CrossFit. He went on and on about how he’s never been in better shape than he was at that time. He told me CrossFit surpasses any challenge he had ever faced in track of any other sport. The next day I found a CrossFit gym and joined. I CrossFit to strengthen my mind, body, and spirit. My mind: The internal dialogue that goes through an athlete’s head during a workout fascinates me. I have been able to apply the mental fortitude I’ve gained doing CrossFit to all aspects of my life—quitting is never an option. My body: simply put, I feel equipped to accomplish (almost) any physical task. My spirit: I’m a happier person because of CrossFit. It has given me an amazing community and countless opportunities for growth as an athlete. Because CrossFit is constantly evolving, it is impossible reach a level of mastery. That leaves me always coming back for more. I coach because I love to help people grow. Any person on any given day can show up to a CrossFit class and leave better than they were when they arrived. That growth can and will be different for every athlete, but nonetheless, it’s still growth and forward moving. I coach for the fist bump I get to give to athletes at the end of a workout. There’s nothing better than acknowledging someone for getting through another grueling workout.